The week before last, I wrote about my interview with the late Kansas City mob boss Nick Civella, when Civella showed up at a 1980 World Series game in seats that a state senator had given to a friend, never intending for them to go to Civella. 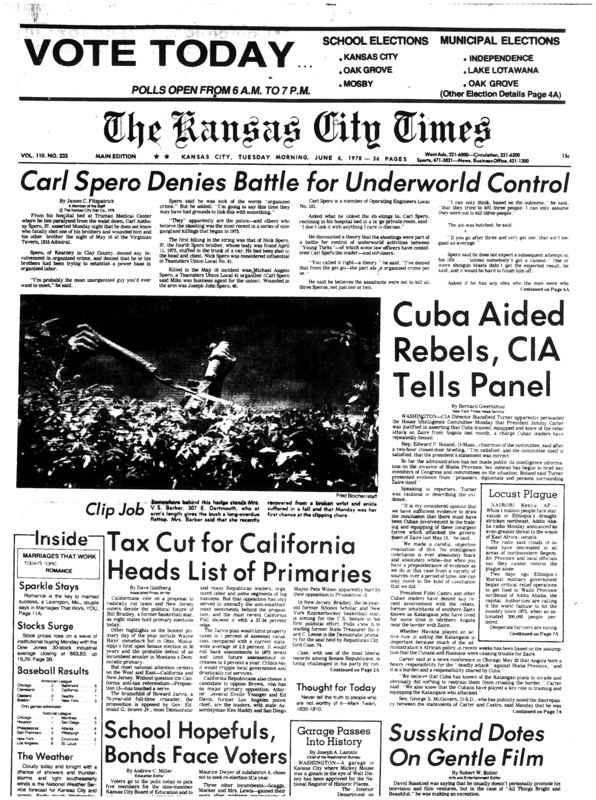 Today, I’ll tell you about my only other interview with a mobster, the late Carl Spero, who, along with his three brothers tried, in the 1970s, battled Civella and his associates for control of local underworld activities. 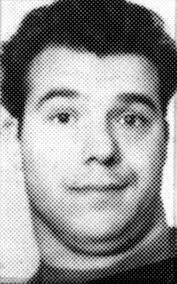 With a fusillade of bullets, the intruders killed Mike Spero and wounded Joe Spero, both of whom had been sitting in a booth. Carl Spero, who was sitting at the bar, bolted for a side door when the shooting started and was struck in the back by a shotgun blast as he reached the sidewalk. Paralyzed from the waist down, Carl was taken to Truman Medical Center, where he spent the next few weeks. I was covering Jackson County politics and government at the time, and one night a couple of weeks after the shooting, I was chatting with Skip Sleyster (now deceased), a rough-around-the-edges but very successful commercial property owner. Sleyster also had a Democratic political club, and that’s why he was at the function that night. Ironside was a popular TV drama starring Raymond Burr, who, ironically, played the role of a paraplegic chief of detectives. The show ran from 1967 to 1975 and was in reruns in 1978. Skip set up the interview for the following Monday night, June 5. Nervously, I went to Spero’s room — a police officer stood outside — and he welcomed me in a strong voice. He was eager to talk. Sitting up in his bed, he answered questions for an hour. During that time, about six other visitors came in, and he took a few telephone calls. But for the most part he was focused on our conversation. After the interview, I raced back to The Star, which is just a few blocks north of the hospital, and started banging away on my IBM Selectric typewriter. I remember that the copy editor on the story — the person who wrote the headline and put the final edit on it — was a lanky British fellow whose first name was Peter. He had just a few questions for me; otherwise the story sailed through the editing process. The next morning the story was stripped across the front page of The Kansas City Times, then the morning edition of The Star. It “jumped” inside, where the rest of the story took up almost half a page. As you can imagine, it was an exhilarating experience, from the moment Skip mentioned the possibility of an interview, and it was one of my most memorable stories. Oddly, however, just as with the Civella story, I didn’t save the clipping itself. And, as with the Civella story, I had to go to the Downtown Kansas City Public Library and locate it on microfilm. Now, here’s the rest of the Spero story. I feel sure I laughed at that comment, but it turned out to be prescient, if only slightly off target. I greatly underestimated the determination of the Civella group. They had no intention of letting Spero off the hook with paraplegia; they fully intended to finish him off. Six months after the Virginian incident, the FBI wiretapped a conversation that showed just how serious the Civella group was about killing Spero. The principals in that conversation, which took place in a Northland home, were Nick Civella; his brother Carl “Cork” Civella; Carl “Tuffy” DeLuna, who allegedly planned and participated in the tavern shoot-up; and two Las Vegas casino executives. Nick Civella had called the conference to discuss changes in casino operations (he had a hidden interest in at least one) and to plot the demise of Carl Spero. According to a transcript of the conversation, Nick and Cork talked of ways to get to Spero, who lived in a remote part of Clay County, with a lot that was free of trees or other landscaping. The bloodhounds got Joe Spero first. In June 1980, a bomb exploded at a Clay County storage shed, hurling him 50 yards through the wall of the shed. He died instantly. In January 1984, the bloodhounds closed in on the last remaining Spero. One morning when Carl entered the office of a Northeast area used car lot owned by his cousin, a nail-bomb exploded. Carl, who had escaped with serious injuries at 38, was dead at 44. That was just mop-up business, however, because by then Nick Civella was gone — having died a year earlier, shortly after being released from prison — and the mob was on the way to becoming a shadow of what it used to be. The last few days before Christmas I had a hard time finding stories that interested me in either The Star or The New York Times. That’s unusual, but, of course, we’re talking about the one time each year when many of us both speed up (to get ready for Christmas) and slow down, as we withdraw from the day-to-day routine. But today…bam!…the news is back. Time to fire up and roll forward. Consider three of the more interesting subjects I found in this morning’s Star. A 67-year-old Kansas City woman named Georgia Walker will soon be ordained as a Catholic priest. “How’s that?” you might be saying. Well, the ordination will not be recognized by the Catholic Church, which, in fact, will excommunicate Walker. But nevertheless she is getting ordained. Her ordination will be performed next month by Bishop Bridget Mary Meehan, who, according to reporter Matt Campbell’s story, “travels the country ordaining women priests and deacons — 25 of them in 2014.” The ordination will take place at St. Mark Hope and Peace Lutheran Church, 38th and Troost. The “only-men-can-be-priests” rule makes no sense historically or logically. Listen to what Donna Simon, pastor at St. Mark’s, said in Campbell’s story. And why did the church “just pick that one thing”? Because, in my opinion, it sounded good and insured the men folk their decisions wouldn’t be challenged by female logic, which, as we enlightened men understand, far exceeds our own. I was sorry to read that some people operating under the banner of my Democratic Party had phonied up signatures on a petition seeking a statewide vote on an early-voting initiative. Certainly an aberration, right? Because we Democrats do things the right way at least 99.9 percent of the time. But not this time. A law firm commissioned by local political consultant Jeff Roe, a Republican, found more than 2,200 fraudulent signatures that were submitted to Secretary of State Jason Kander’s office. Some of the signatures were in the names of people who were, uh, dead…They didn’t sign and then die; they died and then signed…or, you know, somebody signed for them. More than half of the fraudulent signatures came from Boone County, home to the very liberal-leaning city of Columbia. Even with the phonied-up signatures, the petitioners did not have enough valid signatures to get the proposal on the ballot. The way these petition drives usually go, the organizers hire people to gather signatures, with the petition carriers getting a certain amount for each signature — say 20 cents. So, there is an incentive to cheat. With well-organized, well-run and well-policed petition drives, the chances of a lot of fraudulent signatures getting affixed to petitions are small…I suspect this was a fast and loose petition drive. …If an early-voting measure sounds familiar to you, in November we voted on one that the Republican-dominated legislature placed on the ballot. Like most of the stuff that the General Assembly comes up with these days, it wasn’t a legitimate early-voting proposal. It was a mishmash under which Missouri residents could have cast ballots on six business days — but not consecutive days and not weekend days — before a scheduled election. Fortunately, Missouri voters defeated that proposal by a wide margin. This latest caper — with the fraudulent signatures — could set back the cause of early voting in Missouri. Too bad, because even Kansas has had early voting for many years. This is another one of those urban-rural deals, where, in general, the outstate legislators want higher speed limits and urban legislators (who comprise the vast minority in Kansas) understand that the higher the speed limit, the more dangerous the highways. Yes, like your head, your legs and your torso. When we go out on the road, I usually drive about 65. When Patty takes over, we go 75, and I close my eyes and try to nap. Every Friday I have lunch with my two old Army buddies — the only two I’ve got — from our years together in the U.S. Army Reserve. Yesterday, only one of them was on hand, and we got to talking about the old mob days in Kansas City. 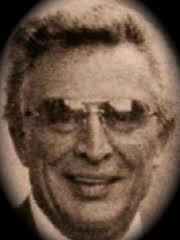 That was back in the 70s, when the late Nick Civella, the godfather of “The Outfit” in Kansas City, held sway. He and his boys oversaw a widespread bookmaking operation, and Civella also had a piece of a Las Vegas casino. Periodically — every few weeks, I think — one of his lieutenants would take a plane full of gamblers out to Vegas for the weekend, and the lieutenant would not only return the gamblers but also a briefcase (or maybe just a sack) full of cash, representing Civella’s cut of the casino proceeds. Civella was also involved in the River Quay, by the City Market, for the two or three years that entertainment district was as popular or more so than Westport. It all went to hell, however, after a guy named Freddie Bonadonna, owner of a River Quay bar called Poor Freddie’s, refused to give mob members a cut of revenue from a city parking lot that he leased. After that, several establishments were burned or blown up, including Poor Freddie’s. Before the explosions and arsons, the situation was so intense that a fearsome, Civella-linked mobster named William (Willie the Rat) Cammisano and one or more “associates” apparently killed Bonadonna’s father to show Freddie how serious they were about wanting a piece of the parking revenue. Civella reportedly gave Cammisano a wide berth to operate pretty much as he pleased. Freddie ended up going into the witness protection program and testified against several mob guys, and Civella and his top guys ended up in prison. Civella died in March 1983, two weeks after he was released from prison because he was dying of lung cancer. Willie the Rat succeeded Civella as crime boss, but the organization faded in the 80s, and mob activity in Kansas City, thankfully, has never been the same. A lot of people have stories about interactions with Nick Civella, and yesterday I told my Army buddy about mine. The Royals’ first went to the World Series in 1980, and they played Phillies. The first two games were in Philadelphia, and when the Sunday, Oct. 19, game came around in Kansas City, the Series was tied two games apiece. 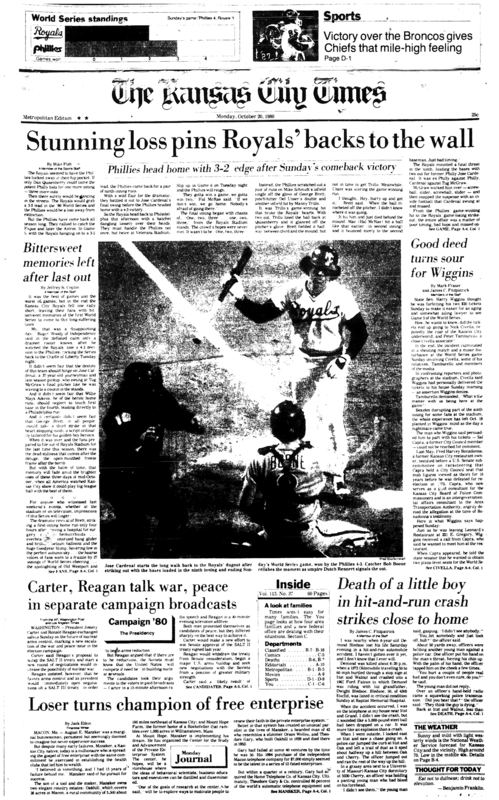 I was a general assignment reporter for The Kansas City Times, the morning edition of The Star, and I was one of several reporters stationed at Kauffman Stadium to cover any general-interest stories that might crop up. From a seat behind the backstop screen, I was relaxing and enjoying the game when another reporter who had checked in with the office — on a pay phone, of course — told me to call the assignment editor because something significant was going on at the ballpark. I called right away and was told that a state senator named Harry Wiggins — many of you probably remember him — had called the office and had told an editor that Nick Civella and one of his lieutenants were sitting in plaza-level seats that Wiggins initially had tickets for. Wiggins told the editor he had swapped the plaza (lower) level tickets for seats higher up at the request of a former Kansas City councilman named Sal Capra, who told Wiggins that he wanted to help an aging and ailing friend get lower-level tickets. Wiggins, who was a prince of a fellow, agreed and gave Capra the tickets, which he presumed Capra was going to give to his friend. Wiggins also was a first-class glad-hander, and he couldn’t resist the opportunity to go down and introduce himself to Capra’s friend. But when he got down to the seats, he found them occupied by Civella and Pete Tamburello, one of Civella’s enforcers. Realizing that it wouldn’t look good if it came out later that Nick Civella and Pete Tamburello had sat in his seats at the World Series, Wiggins immediately called the newspaper. After speaking with Wiggins at the stadium, I and a photographer went down to the concourse behind the area where Wiggins’ original seats were, and we spotted Civella and Tamburello. A Channel 9 anchorman named Scott Feldman had also learned about the situation, and he and a cameraman were also in the area. The presence of a couple of reporters and a cameraman and a photographer would create a commotion almost anywhere, and after just a few minutes, an irritated Civella and Tamburello got out of their seats and came back to talk to us. Civella told a bald-faced lie, saying that he not only got the tickets from Wiggins (he got them from Capra) but that Wiggins had delivered the tickets to his house before the game. During the conversation, Tamburello shoved a camera being held by Channel 9 cameraman Phil French. Civella slapped at a camera that KC Times photographer Bill Batson was holding. In addition, at least one of Civella’s sons and a few other associates — guys who seemingly materialized out of nowhere — began crowding around, hemming us in. By then, fans in the area were calling for all of us to sit down, and Civella and Tamburello returned to their seats. Batson and I — and I believe Feldman and French — lingered in the area, and pretty soon Civella and Tamburello got up and, as far as I know, left the stadium. I went to a pay phone and told a rewrite reporter, Mark Fraser, what had transpired. Fraser wrote it up — spicing it up with plenty of background about Capra, Civella and Tamburello — and, bingo, it ran on the front page on Monday, Oct. 20, next to a photo of Royals’ player Jose Cardenal leaving the batter’s box after striking out in the bottom of the ninth to end the game. Many of the principals in that incident are dead, including Civella, Tamburello, Wiggins and Batson, the photographer. Capra is still alive, and so is Mark Fraser, my co-writer on the story. I have no idea where Feldman and French are, or if they are still alive. It was a bizarre and unforgettable story. …One other thing about that game and that story: Those tickets for the plaza-level seat down the third base line? Their face value was $20 each! Do you know what a pair of tickets in that section would have gone for in this past World Series? Probably more than $1,000 each. Now, here’s an image of the first part of the story — the part that appeared on the front page, before the story “jumped” to an inside page. In the photo, Civella is in the center, facing me. Tamburello, I believe, is to my right. Batson, of course, was taking the photo. With the Golden Ox closing on Saturday, Patty and I have been wanting to go down there, for old times’ sake, to see the old haunt one last time. So, last night was the night. We decided to meet at the bar at 6:30 and maybe have dinner there. Visions of a charbroiled steak cooked over curling flames danced in my head. But already I jump ahead. In the back of my mind, I also looked forward to once again seeing Kemper Arena — a venue that had quietly and unnoticeably receded into my past. When I was a young reporter — and a single young man — in the early 1970s, Kemper Arena had been a significant part of my life. As an up-and-coming political reporter, I wrote several stories about the negotiations and maneuvering to get Kemper Arena constructed. And once it was up, I began attending events there, including basketball and hockey games, American Royal events and, of course, concerts. The best concert I ever saw — Paul McCartney & Wings — took place there in May 1976. I loved and hated Kemper Arena. I used to park in Lot A, which is on the west side of the arena, beneath the viaduct that peels off Cesar Chavez avenue and swings down, down, down into the lowest point of the arena grounds. Lot A is a relatively narrow hodgepodge, with pockets of parking here and there, broken up by the big concrete piers that support the curving viaduct above. As I recall, the lot was never properly paved. It was a mishmash of rocky patches, potholes and mud pools. And it was always wet down there. But the arena, blue on the inside and with gently sloping banks of seats, offered good sight lines and was relatively comfortable. 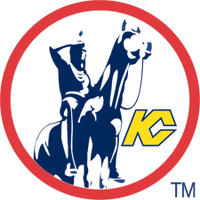 I attended many Kansas City Kings and Kansas City Scouts games there, and even though the teams were mostly bad, it was the NBA and the NHL — right there, right then — in Kansas City. For this native of Louisville, Kentucky, which had no major league franchises, it was big. So, last night as I coursed down that viaduct and passed Lot A, I thought about the good times I had had at the arena. I did some quick calculations and figured that I had attended well over 100 events at the arena, maybe 200, maybe more than that. 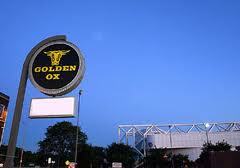 The first thing I noticed at the gently curving bar of the Golden Ox was a man wearing a large, tan cowboy hat. It was like Groundhog Day for me; I cannot recall a time I have been there that I didn’t see at least one cowboy hat at the bar. It wasn’t completely like Groundhog Day, however, because there were only about 20 people in the bar area, instead of scores of people. Also, there were no loud conversations or raucous laughter, no clouds of smoke, no guys eyeing and edging in on women seated at the bar. A bartender — I think her name was Connie — was pouring very stiff drinks. Patty’s eyes widened as the lady held the bottle of Scotch up…and held it…as the last of the golden contents passed from the bottle into the glass that ended up in front of her. We could see, through the bar area and off to our left, that people were seated at several tables in the dining room. It didn’t look particularly busy, and it appeared to me that we would be able to go over and get a table whenever we wanted. Pretty soon, Patty suggested that I go arrange for a table. By this time it was a few minutes after 7. When I circled around to the reception station, I found it unmanned. One man — another prospective diner — was in front of me, and it appeared, from the bored and slightly agitated look on his face, that he might have been waiting for a few minutes already. I joined in the wait. Two or three minutes went by. Nothing. Five minutes went by, nothing. Meanwhile, I was assessing the situation in the dining room, and it looked like people were actually eating at only one table. Always a bad sign. I looked over at the charbroiled grilling area, where, in the past, the flames danced and the steaks sizzled continuously. But now there were no steaks (that I could see), no flames, no sizzle. A lone employee — a cook, I presume, although he bore no identifying characteristics — ambled back and forth in the cooking area, but to no apparent end. My enthusiasm for that steak that I had envisioned earlier was starting to wane. I was now anticipating poor service, a lengthy wait and, very likely, a disappointing steak. I walked back to the bar area, told Patty that a host was nowhere to be found and gave her a one-word assessment of the dining room environment: moribund. A veteran of many restaurant “boltings,” I suggested that we consider eating someplace else. She suggested that we wait a few minutes and make another run at getting a table. After about five minutes, I went back over to the reception area and there he was — the previously m.i.a. host, wearing black pants and a black shirt with the Golden Ox logo. “Table for two?” I said, hopefully. By “seating” his last table, it was clear that what he meant was not that the place was full — hardly — just that he wasn’t going to seat anyone else for dinner. I looked at my phone. It was 7:16. “OK,” I said and retreated to the bar. Minutes later, we put on our coats, walked across the street and entered Voltaire, where the hostess met us with a smile and a gesture to an open table. Along the left-bank row of table, people were chatting and laughing. At the near end of the bar, the bartender was providing background music by playing records — vinyl LP’s, plucked from a multi-level cabinet — on an open-top turntable. “It smells a lot better in here,” Patty said. Just like that, we had left the past and hurtled into the present. It’s Friday Favorites at jimmycsays. We gathered the staff together, went over some of the New York Times and Kansas City Star stories that stood out this week, and then we voted on awards in various categories. Sen. John McCain, who fought in the Vietnam War and was tortured when held hostage in North Vietnam. McCain staunchly supported releasing the report, and in so doing effectively neutralized the whining and hair-pulling opposition of some of his Republican colleagues. 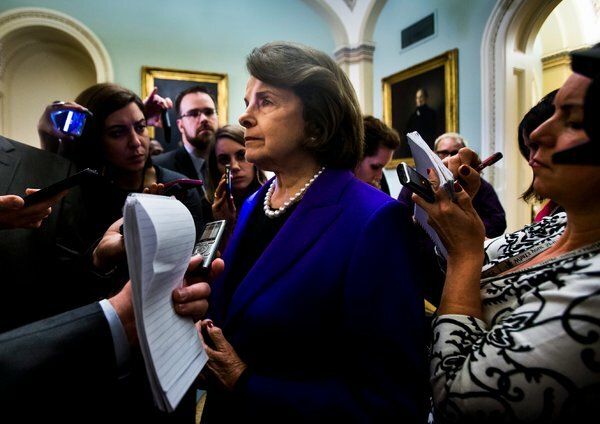 On the Senate floor, he argued that the U.S. shouldn’t resort to torture not just because they’re ineffective and potentially dangerous but because they undermine the nation’s values and beliefs. “I have often said, and will always maintain, that this question isn’t about our enemies; it’s about us. It’s about who we were, who we are and who we aspire to be. It’s about how we represent ourselves to the world.” If McCain had stayed true to his maverick self in 2008, he might have been elected president. Sen. Majority Leader (soon to be Minority Leader) Harry Reid. In an interview with the New York Times, Reid indicated he was itching to go to the mat with the Republican majority that will take over Jan. 6. “They want to eviscerate Clean Air, Clean Water, E.P.A…Is there enough they can do to help Wall Street? I don’t think so. Big banks? I don’t think so. That’s where the new battle is going to be.” I can hardly wait. Uh-huh, yeah. Michael S. Jeffries, longtime c.e.o. of Abercrombie & Fitch. At age 70, he retired in the wake of the hip clothier’s dimming fortunes. Jeffries once said that Abercrombie was exclusionary and sought to attract only “the cool kids.” An NYT story said that employees traveling on the company’s Gulfstream jet had to greet Jeffries with “no problem” in response to any requests “and their uniform was dictated down to the boxer briefs.” I’m guessing my full-cut Dillard’s boxers would be a problem. Jackson County Prosecutor Jean Peters Baker. 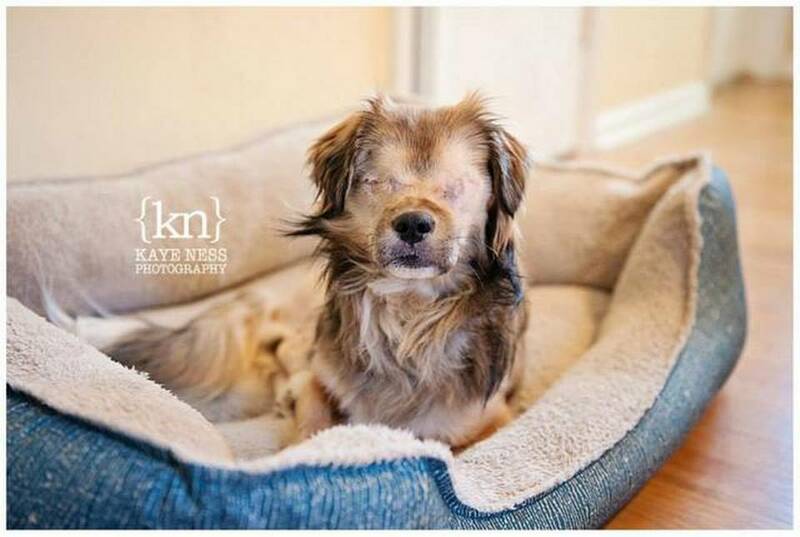 The Star reported Wednesday that Baker filed felony animal-abuse and animal-neglect charges against a Northeast area woman in the shocking case of a Tibetan spaniel named Roadrunner. As a result of the alleged abuse, which defendant Kimberly Anderson denies, Roadrunner had to have his eyes surgically removed and a plate inserted to repair a broken pelvis. Authorities had issued Anderson a municipal citation, which would have carried a maximum penalty of a $1,000 fine and up to six months in jail. Now, with the filing of superseding state charges, she’s facing the possibility of more than a year in prison. A KC animal shelter employee told me recently that Roadrunner is doing well in foster care and, amazingly to me, showing no signs of psychological trauma. An animal shelter employee is planning to adopt the little guy. The Star’s Laura Bauer, who has relentlessly pursued the back story in the drowning of 20-year-old Brandon Ellingson of Iowa. Brandon was bounced off Missouri Highway Trooper Anthony Piercy’s patrol boat in the Lake of the Ozarks and drowned after Piercy arrested Brandon for boating while intoxicated. Bauer had an investigative piece in Sunday’s paper that clearly showed what a debacle the Highway Patrol-Water Patrol merger has been and how ridiculously little training some highway officers received before being assigned to water duty. Bauer has done such a tremendous job overall that I think her stories could be in play for a 2014 Poo-Litzer Prize. Nevertheless, this award comes with a caveat. In Sunday’s story, Bauer lamely granted anonymity to two retired Water Patrol officers who were critical of the merger. She let them off the hook on the old “fear of repercussions” claim. Huh? What repercussions? Their public-employee pensions are as good as gold, and nobody with the state has any authority over them. That would be like somebody interviewing me for a critical story on The Star and I requested anonymity for fear of repercussions. Hah! Come and get me! You can’t blame Sherry Ellingson for not wanting to return to Missouri after a dozen years of spending summers at the Lake of the Ozarks. 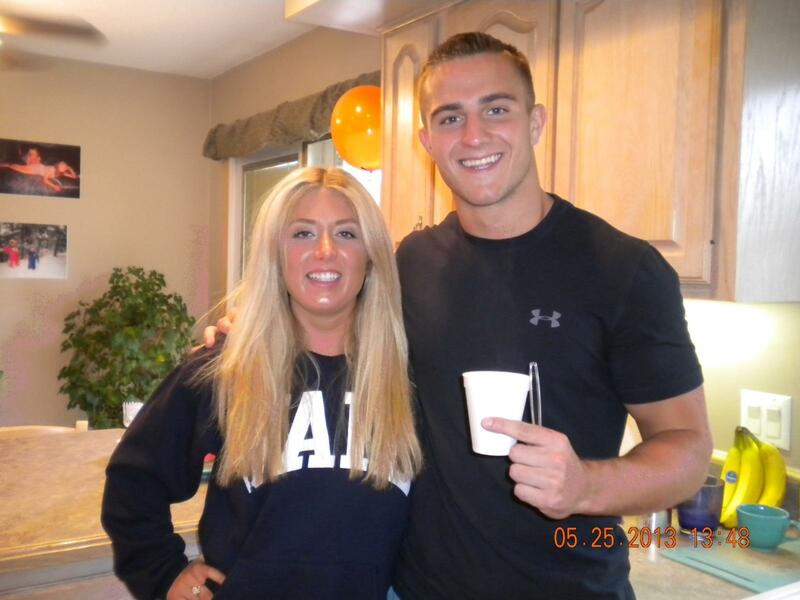 After all, the Missouri Highway Patrol killed her son, 20-year-old Brandon Ellingson, who, by all rights, should be completing the first semester of his junior year at Arizona State University. Yesterday, for the first time since Brandon drowned after being bounced from a Missouri Highway Patrol officer’s fast-moving boat in rough water, I spoke with Sherry – a mother who has lost her only son and whose life is forever changed. We spoke for an hour by phone – I from my home in Kansas City, she from Scottsdale, Arizona, where she has been living since January. Since Brandon’s drowning on May 31, I had wondered how Sherry and her husband Craig Ellingson had been holding up; what the family circumstances were; and if they had other children. One thing I learned from our conversation is that Sherry and Craig (he has handled most dealings with reporters and law enforcement officials), have been separated since last spring – before Brandon’s drowning — and are getting divorced. Sherry resides in Arizona, as I said, while Craig has remained at their home in Clive, Iowa, just outside Des Moines. The couple has made their livelihood by owning and managing about 1,000 apartment units in the Des Moines area. Regarding her own struggles, Sherry said that a very difficult milestone passed last Sunday, when Brandon would have turned 21. The Ellingsons marked the occasion by arranging three simultaneous “celebrations of Brandon’s life” – in Des Moines, in Scottsdale and at the Lake of the Ozarks. Sherry organized the one in Arizona; some of the Ellingsons’ closest friends organized the one in Des Moines; and a group of lake activists who have banded together in support of the Ellingsons organized the third one. 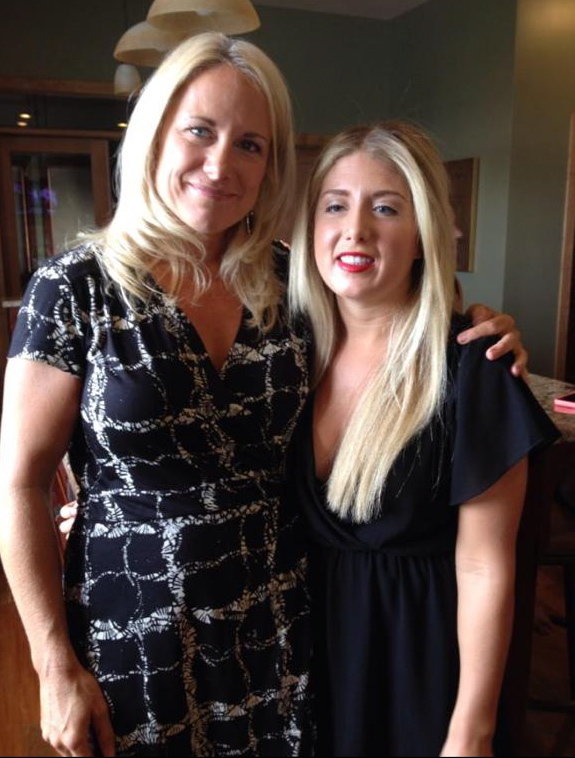 Sherry said she has only met one of the lake supporters but that she is in contact with them daily on Facebook. With the birthday milestone behind her, Sherry now must deal with Christmas and New Year’s. “The holidays, no question, are going to be tough,” she said. 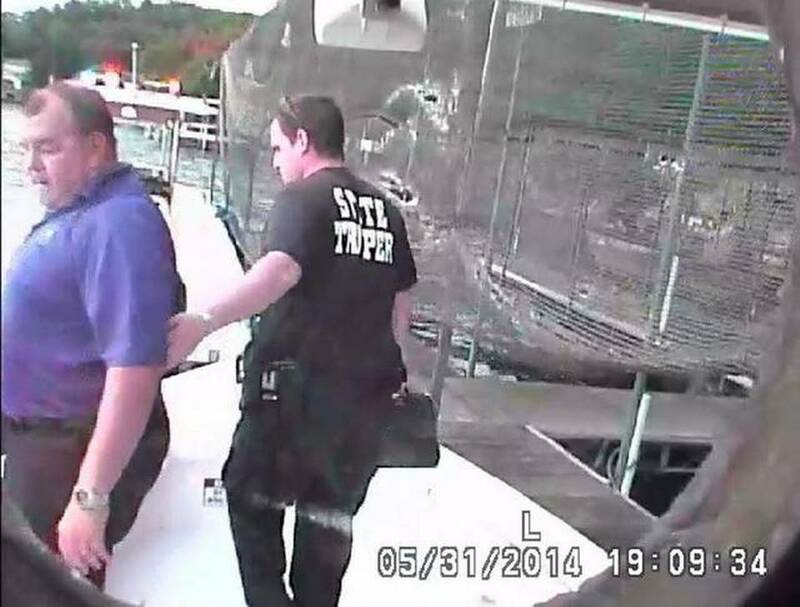 Last Friday, the Ellingsons filed a civil suit in federal court, naming as defendants the Highway Patrol, patrol leaders and, of course, State Trooper Anthony Piercy, who was driving the boat the afternoon of Saturday, May 31. The Ellingsons’ suit contends, in part, that Piercy was negligent and violated Brandon’s constitutional rights. Earlier, after a coroner’s inquest – a relatively informal proceeding — a jury ruled that Brandon’s death was accidental. In addition, a special prosecutor reviewed the case and decided not to bring criminal charges against Piercy,, who was 43 as of September. On the latter front, however, there has been a new development. In a telephone conversation Tuesday afternoon, Amanda Grellner, the special prosecutor, said that she was once again reviewing the evidence based on new information she has received. She said a witness whom she had interviewed earlier has come forward with “more thorough” information. Grellner did not say what the new information was but that it had prompted her to review the case in its entirety. “I want to make sure I go through every single piece of evidence,” she said. Asked whether it was possible that she would seek to reopen the case, she replied, “It’s possible, but I cannot make any promises.” That decision, she said, would be up to the prosecutor and Circuit Court judge who appointed her months ago. That sounds promising. The coroner’s inquest, held in early September, was a certifiable whitewash: Among other things, there was no testimony about how fast Piercy was driving the boat – up to 40 miles an hour or more, according to records – when Brandon was ejected. Also, it did not come out that while his hands were cuffed behind his back, Brandon was half-standing and half-sitting on a high bench-seat with little or nothing to hold onto; he was at the mercy of Piercy, boat speed and the waves. Piercy’s initial story was that Brandon jumped into the water. After that was exposed as balderdash, he changed his story to say he didn’t know how Brandon ended up in the water; just that he looked to his right and saw Brandon’s legs and feet going into the water. The trooper has acknowledged that he improperly placed a life jacket over Brandon’s head and shoulders without fastening it under his arms, as it was designed to be worn. Once Brandon was in the water, the life jacket quickly slid off and floated away. Piercy said he first made several attempts to rescue Brandon without going into the water himself. He didn’t jump in right away, he said, because he didn’t know how to use the personal inflation equipment attached to his belt. When he did go in, he couldn’t hold onto Brandon, and Brandon went under for the last time. Sherry says GPS records and witness accounts indicate that Brandon was struggling in the water for at least four and a half minutes. She said Piercy could have taken any number of steps to rescue Brandon, including grabbing a conventional life jacket – several were on the boat — before going into the water. “He never tried to really save Brandon,” Sherry said. Sherry and Craig owned a house at the Lake of the Ozarks. That’s where Brandon and seven buddies were starting to head back to after an afternoon of drinking beer and playing sand volleyball at a lake establishment called Coconuts Caribbean Beach Bar & Grill in Gravois Mills. The Ellingsons’ house was about 12 miles from the bar, at the end of the Gravois arm. When Brandon and Jennifer were growing up, Sherry and the children spent about two and a half months at the lake each summer. Craig, a private pilot, worked in Iowa during the week and then flew down to the lake to spend weekends with the family. They loved their time at the lake and made friends in the area. “I was proud to be a lake owner; I brought people down there all summer long,” Sherry said. But no more. Within weeks of Brandon’s drowning, Sherry and Craig put the house up for sale. The closing took place two or three months ago. That part of the Ellingsons’ life is over. One of Sherry’s focuses these days is to keep increasing the number of people who have signed an online petition asking U.S. Attorney General Eric Holder to review the case for possible violations of federal law. About 131,000 people have signed the petition. Sherry has not been in contact with anyone at the Department of Justice, however, and said she was not sure what the criteria would be for the department to get involved or what leverage Washington might have with regard to the Highway Patrol, which she believes is fraught with corruption and incompetence. The hearings, which The Star’s Laura Bauer wrote about at length in Sunday’s paper, helped reveal what a debacle the merger was and how little training some highway officers received before being assigned to water duty. For example, a retired Highway Patrol captain who spent 31 years with the Water Patrol said the patrol considered a highway trooper ready to work the water if he had a personal boat and spent time on a lake. By the end of the Tuesday’s interview, it was clear to me that Sherry — along with Craig and other people who have involved themselves in the case — is going to make something happen, push state officials to make some changes, as a result of her son’s death. I observed at one point that while she was doing a lot to call attention to the case and trying desperately to get justice for Brandon, it must frustrate her that she could not make anything specific happen through force of will. On behalf of my readers — and thousands of other people who have been following this case — I want to say…Rage on, Sherry, rage on and carry on. And may Christmas and New Year’s bring some happiness and a measure of soul salving to you, Craig and Jennifer. Over the years, U.S. Sen. Claire McCaskill of Missouri has deftly juggled her political stances in a way that she has maintained the solid backing of her liberal base while throwing enough bones to Missouri’s rural and conservative voters to get elected — and re-elected — to the most coveted political position below the presidency. In 2006, for example, she successfully portrayed herself as a “pro-gun” candidate, a position that went a long way toward helping her defeat incumbent Republican Sen. JimTalent. She has walked the political tightrope in admirable fashion, and I’m a fan of hers. Indications are that she will run for governor in 2016, and I hope she does so and wins. She would be a tenfold improvement over Jay Nixon, and I think even most Republicans would come to share that opinion. But McCaskill has a problem. Since she has been in office, Missouri has gone from a swing state to solid red. As a result, McCaskill will find it more difficult than ever to walk the tightrope and gather enough Republican support to prevail. Which brings me to this: She’s already honing her Wallenda act with a controversial position she has taken in regard to clamping down on sexual assault in the military. Unarguably, McCaskill has exhibited strong leadership in that reform movement, as evidenced by the fact that her bill to force changes in the military’s sexual-assault policies passed 97-0 in March. The measure, which is now awaiting action in the House, would establish new rules for how victims and defendants should be treated. If you haven’t been following this closely, however, it was not the slam-dunk that it appeared to be. A few days earlier, a competing bill, sponsored by New York Sen. Kirsten Gillibrand, a fellow Democrat, was defeated on a close 55-45 vote. The major difference between the Gillibrand and McCaskill bills is that Gillibrand’s would remove from the chain of military command the decision on what charges to bring and which cases to prosecute. Instead, under Gillibrand’s bill, those decisions would be placed in the hands of independent prosecutors. One of McCaskill’s arguments for letting military commanders continue to make those calls is that prosecutors are more interested in victories than in simply bringing cases. Thus, she says, independent prosecutors would be less inclined than commanders to file charges in cases where the evidence is equivocal. Now, if you ask me, Gillibrand’s position makes far more sense than McCaskill’s. Having independent prosecutors make decisions on whether to bring sexual-assault charges seems far preferable than keeping commanders in charge — commanders who, in many cases, might oversee both the victim and the accuser. A strong indicator of the desirability of Gillibrand’s approach is the fact that 10 Republican senators joined 35 Democratic senators in voting for Gillibrand’s bill. Obviously, that’s no small feat in Washington’s stand-off political environment. Among the 10 Republicans who voted for Gillibrand’s bill were three of the most high-profile members of the upper chamber: Minority Leader (now Majority-Leader-elects) Mitch McConnell of Kentucky and Sens. Ted Cruz of Texas and Rand Paul, also of Kentucky. To McCaskill’s concern, I’m sure, this issue does not appear to be firmly settled. A week ago today, Gillibrand and several other senators who favor her position (including Cruz and Paul), held a news conference and said they would push for another vote on the issue. That could happen if amendments are allowed to the National Defense Authorization Act, which outlines Defense Department spending priorities. But that is a long shot, mainly because two men who oppose opening the door to amendments are Senate Armed Services Committee chairman Sen. Carl Levin, a Democrat from Michigan and Sen. John McCain, a Republican from Arizona. In a recent New York Times story, Levin said he worried that allowing amendments would open a “Pandora’s box” of other requests. In any event, interesting lines have been drawn, and the battle isn’t over. 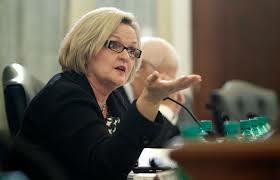 If the issue is resurrected, McCaskill could come under a harsher, hotter light for her position. It could get to the point that some, or many members, of her liberal base might decide that McCaskill, while talking a good game, is actually afraid to stand up to the Pentagon. In reality, though — at least in my view — timidity is not the issue; it’s politics. She’s just projecting how the issue will play in outstate Missouri…where it pays to be with the generals.